WOULD YOU like to hone your intuitive abilities? One of the favorite archetypes found in the 78 cards of a Tarot deck is the High Priestess, Key #2 of the Major Arcana. She represents spiritual awakening and development of the universal intuitive mind. She is awesome and mysterious as she sits between the two pillars of the temple entrance and in front of a veil that drapes the entrance to a temple. The temple symbolizes the higher knowledge, spiritual knowledge, the sacred truths (both personally and cosmically), or the Holy Grail that we all seek. This temple holds both sacred, universal secrets as well as the guidance required to unravel our own personal issues. Behind her is the veil between this world and the “other” world – the veil that separates that which we know from that which we long to know. She is the guardian of the occult, of hidden knowledge; the scroll that she holds represents arcane teachings – lessons that those on a spiritual path must learn. She emphasizes the essential role of the unconscious mind as a source of those sacred teachings that direct the soul’s evolution and growth. As the gatekeeper to these spiritual mysteries, the High Priestess encompasses the larger intent of the Tarot deck – to guide us not only on our earthly journey, but also on our spiritual path. Thus the pictorial journey portrayed in the Tarot is meant to aid us in invoking the wisdom and power locked within ourselves. The High Priestess is essentially the “spokeswoman” for the entire Tarot deck because the Tarot’s system enables us to access the vast storehouse of knowledge stored within our unconscious mind. As the gatekeeper of the deeper truths found in the Tarot deck, she is the container and personification of our intuition. The energies that the High Priestess embodies live within each of us. This inner High Priestess "template" shows us how to invoke our hidden, inner powers and bring them forth. She shows us how to develop our intuition and psychic ability. Each person holds this timeless archetype within. We might call it the experience of "High Priestess-ness" that lives within the unconscious. The High Priestess archetype is also the representation of someone who is committed to service, who is in service to Spirit and who seeks to see Spirit in all things. She is the bridge that allows us to communicate with Spirit. The potential for this spiritual communion is within ourselves -- we can awaken this archetype through our work with the Tarot. How does this process of awakening an archetype within ourselves really work? Archetypes are inherited behavioral patterns or reflections of forgotten memories. These are the images, or templates, of the soul's journey which Carl Jung named the collective unconscious. According to Jung, the information found in the unconscious contains the myths and cross-cultural archetypal experiences that unite all of humankind. Each Tarot image, Major and Minor Arcana alike, portray archetypes that speak to us about our common experiences as we make our earthly and spiritual journeys. Some of these universal experiences are obvious: The Empress represents the Great Mother and the Hermit is the wise old man. 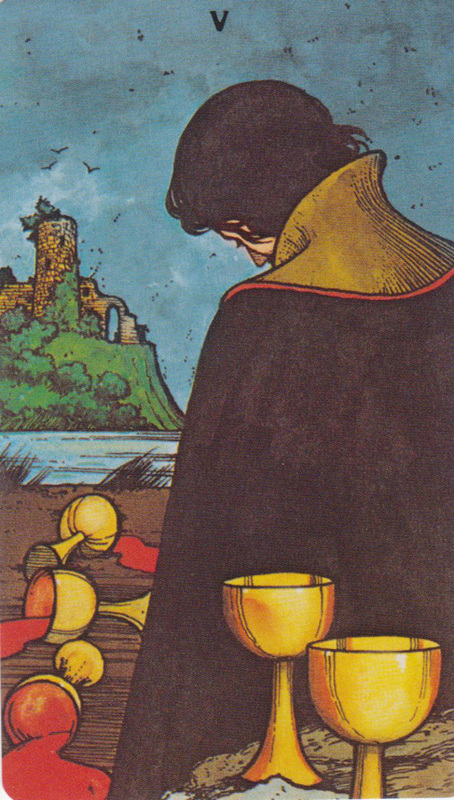 Others are more subtle: the 5 of Cups portrays the universal experience of loss or despair and the 4 of Swords captures the need for renewal, retreat and revaluation that we all experience from time-to-time. The Tarot cards are a visual expression of archetypal experiences that speak to us about our lives. They provide a mirror with which we see our inner selves, enabling us to make sense of events and the world in which we live. Seeing ourselves mirrored in these universal images can be both validating and healing. The images of the journey portrayed in the Tarot can help document, validate and promote our growth and development during the course of our earthly and spiritual journeys here on earth. The High Priestess is the universal symbol for the concept of the inner Spirit, the inner intuitive voice. If utilizing your intuition is a new experience for you, or if you want a unique but direct approach to honing your intuition, you can use the High Priestess card to aid you in developing that skill. EVERYONE has intuition, everyone has the ability to access that intuition. Our culture, with its emphasis on science, fact and reason does not promote the value of intuition and our humanity has suffered because of this. Currently, there is a renewed interest in mysticism, spiritualism and various intuitive tools. Tools like the Tarot, the Rune Stones, the I Ching and crystals are becoming accepted into the mainstream. There are other indications in our society of renewed interest in the development of intuition. Many spiritual leaders believe that a spiritual revolution and transformation are occurring and that the expression of our intuition is a cornerstone in that process. Carolyn Myss, author of Anatomy of the Spirit and Sacred Contracts and an internationally known speaker, states that our spiritual journey is about “breaking our allegiance to human reason and entering into divine order.” Marianne Williamson, author of A Return to Love and Everyday Grace, also an internationally known speaker says, “We are now experiencing an alteration of collective consciousness . . . a spiritual renaissance is sweeping the world . . . it is a revolution in the way we think. It is a shift in our understanding of who we are and what our purpose is on earth.” Tools like the Tarot offer a blueprint for carving out this shift. Now if you want to explore Tarot as a tool for invoking and developing your intuition and wise inner voice, you, can "invite" the High Priestess to come to your aid. Simply take the card, place it before you, light a candle, take some deep breaths and gaze at the image. Look into the High Priestess’s eyes, notice the colors in the card and the other symbols in the card. Breathe in the energy that is emitted from the card. Close your eyes, be still and quiet. 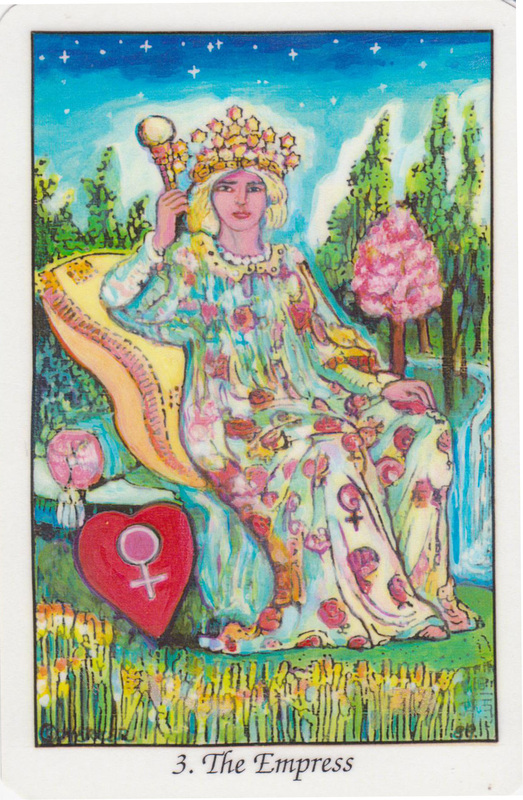 Since the High Priestess archetype is within each of us, simply gazing at the card will trigger a release of this archetype within you, stimulating your own inner intuition and wisdom. You can focus on the High Priestess in a meditation or when you seek guidance about a decision or problem. Besides meditation on the card’s image, you can carry it around with you, tape it to your bathroom mirror, or display it in any strategic place in which the imagery will “impregnate” your psyche. As your unconscious becomes saturated with the potent image of the High Priestess, she may assist you in invoking hidden, inner powers. She may also act as a vehicle of purification and help you bypass your ego and your logical, conscious mind. This quiet meditation on the High Priestess card can signal the unconscious that you want to make contact with it and its vast resource of intuitive wisdom. Another method to receive intuitive help from the High Priestess is to is to do some writing about the card. You might begin by simply asking the High Priestess if she has an intuitive message for you. Then just start writing; don’t worry about periods, commas, spelling and rules of grammar. This process is similar to automatic writing in which you allow some higher wisdom to come through you. For it to work, however, you will need to give up judging, evaluating and correcting your thoughts. Just let the words flow through you. Another method is to ask the High Priestess to give you an intuitive message before you go to bed at night. You can write out your question. Do some quiet breathing and focusing and then place the card, along with your question, under your pillow while you sleep. When you are asleep, your unconscious mind is more available; the conscious mind is out of the way and will allow you to communicate with the High Priestess archetype from a deeper part of your mind. As soon as you wake up, record any dreams, messages, impressions that you have had during the night. Because the High Priestess is the gatekeeper to the unknown, she may also be able to help you understand your dreams and interpret their message. You can also try drawing, painting or making a collage of your own interpretation of the High Priestess archetype, however you might conceive it. This act of creation will affirm and honor the intuition that resides within you and doing some creative work like this will open you up to receiving messages. A final step you could take would be to do a reading on how the High Priestess could help you use your intuition to solve some problem or get advice about some situation in your life. The following spread will guide you to a specific intuitive message. I hope you will use the High Priestess Intuition Spread to help you contact your own intuition and see how the High Priestess archetype manifests within your psyche. Once you receive your message, spend some time with the cards that you have drawn. Keep them on display if you can, see what happens. 1. This card represents you and the situation or problem for which you would like intuitive guidance. 2. This card shows what is blocking you from hearing, receiving or trusting your intuition. 3. This card represents the intuitive guidance and it shows you a specific action that you can take. 4. This card shows you how to honor the intuitive guidance. 5. 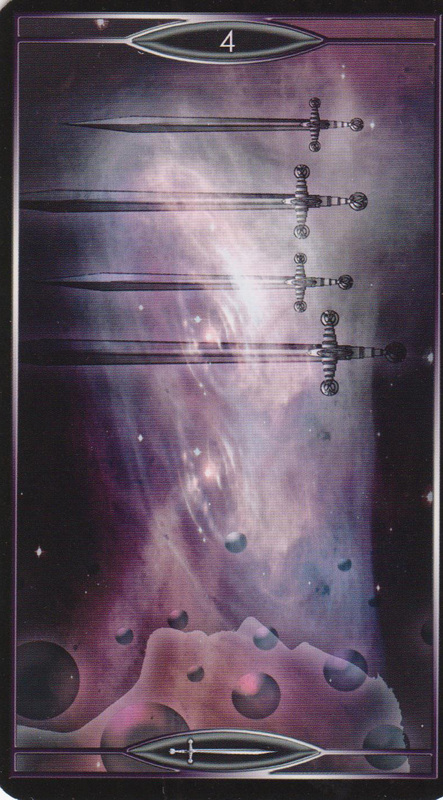 This card shows you the outcome of your situation if you honor the intuitive guidance you have received. Even if you know nothing about what the Tarot cards mean, or how they work, you can interpret and understand the cards. Look at the pictures and ask yourself what is happening in the card. If there is an image of a person in the card, ask yourself this question: If this person could speak, what would he/she say? What would his/her advice for me be? So tonight, light a candle and study the High Priestess card. Let the wisdom if the Tarot archetypes, as channeled through the High Priestess, be your guide. Let the High Priestess that dwells within you, lead you to your intuitive mind. The images in this article are from the Morgan Greer Tarot deck and the Rider Waite Tarot deck. Geraldine Amaral is the co-author of Tarot Celebrations: Honoring the Inner Voice, creator of “Tarot 1-2-3,” an instructional video and has been writing for Pathways for 20 years. She fell in love with the Tarot about 30 years ago when she had her first reading and has been using, studying and writing about the Tarot ever since. She utilizes Jungian/archetypal psychology and Divine Metaphysics in her work and is a respected/gifted intuitive counselor and nationally-known teacher. She focuses her work on how to apply the Tarot's esoteric principles in pragmatic ways as well as for insights and personal transformation. Her classes provide a unique blend of spirituality, psychology, philosophy, humor, literature and personal empowerment methods. She can be reached at 703-671-7421 or geraldine@thespiritualtarot.com. You can visit her website www.thespiritualtarot.com.